Home » Common Health Questions » How long does Vyvanse stay in your system? What is Vyvanse? What is Vyvanse used for? Vyvanse is a Brand name for a medicine that contains lisdexamfetamine as an active ingredient. It works as a central nervous system stimulant as it affects brain chemicals and nerves that may lead to hyperactivity and impulse control. Chemically it is a prodrug form of the well-known psychostimulant d-amphetamine which is linked with the essential amino acid L-lysine. It was developed and manufactured in that form so that the amphetamine is released and activated more gradually as the prodrug form of molecule is hydrolyzed consequently leaving off the amino acid-during the first pass metabolism. It is used to treat ADHD – attention deficit hyperactivity disorder in children and adults and BED – binge-eating disorder in adults. Many health professionals consider Vyvanse to be a “new and improved” replacement of the drug Adderall. Drug Enforcement Administration (DEA) considers lisdexamfetamine in a group of Schedule II controlled substance. 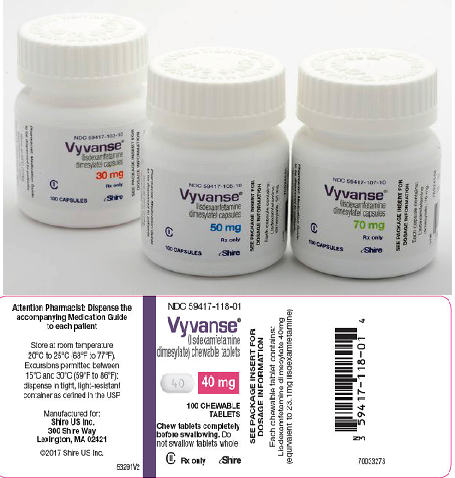 FDA approved Vyvanse in 2007 and it is manufactured by Shire Pharmaceuticals. The standard initial dose is 30 mg per day. The dose should be slowly increased during therapy until you reach the dose that you respond to best. The maximum alowwed dose is 70 mg per day. How does Vyvanse work in the body? Lisdexamfetamine is a pro-drug form of pscyhostimulant called dextroamphetamine. It acts predominantly by inducing the release of dopamine and norepinephrine from nerve terminals. Both of these neurotransmitters contribute to mental alertness, increasing focus, and sustaining thought, motivation and effort. Dextroamphetamine works as a TAAR1 agonist and VMAT2 inhibitor. Dextroamphetamine is also believed to work by binding to the dopamine transporters or DAT thus increasing extracellular levels of the biogenic amines such as dopamine, norepinephrine (noradrenaline) and serotonin. However, the appropriate therapeutic action in ADHD is not known. After discontinuation of Vyvanse, may experience: lethargy, brain fog, and an array of other debilitating this drug withdrawal symptoms. Such effects may lead you to wonder if any of the drugs is still remaining within your body. To determine how long Vyvanse is likely to stay in the body, it is necessary to inspect its elimination half-life. How Long Does Vyvanse Stay In Your System – Blood, Urine, Hair, Saliva? The elimination half-life time of Vyvanse is calculated to be less than 1 hour, according to some data it is suggest to be nearly 45 minutes. This means that following Vyvanse use, nearly 50% of an taken dose will be eliminated from your body in just one hour. For complete clearance of Lisdexamfetamine which is the main ingredient it will take between 4.3 and 5.5 hours which is estimated as extremely short duration. But, it has to be known that Lisdexamfetamine is metabolized to dextroamphetamine and L-Lysine. Dextroamphetamine has a much longer elimination half-life time than Lisdexamfetamine ranged between 9 to 11 hours. This means that dextroamphetamine will remain in the body for between 2 to 2 and half days after post-ingestion. Although numerous other secondary metabolites of lisdexamfetamine such as benzoic acid have a longer elimination half-life time than lisdexamfetamine, they are excreted quicker than their parent metabolite dextroamphetamin. Because of an average elimiation time of 10.4 hours for dextroamphetamine, most patients should fully eliminate Vyvanse and its metabolites in under maximum of 3 days. Does Vyvanse show up on drug tests? Will Vyvanse make you fail a drug test? Yes, as an amphetamine type of drug, Vyvanse shows up on drug test. There are many different types of tests that can detect the dextroamphetamine which is the metabolite that is formed after metabolism of lisdexamfetamine. Types of drug tests that are capable of detecting dextroamphetamine are following: blood tests, urine tests, hair tests, and even saliva tests. However the most commonly used is a urine test. Amphetamines are usually remain detectable within urine test for up to 3 days of Vyvanse administration. Factors that may influence how long Vyvanse stays in system? Even though the regular time for Vyvanse clearance from the system is about 3 days, some patients may need longer time to excrete the drug, while others eliminate the drug faster. Factors that may influence the elimination speed differences may include: individual factors (age, weight, liver/renal function, genetics, metabolic rate, hydration, urinary and gastrointestinal pH), frequency of use, dosage and co-administration of other drugs. How age may influence Vyvanse elimination? Even though there aren’t any specific studies that have analyzed differences in absorption, distribution, and metabolism of Vyvanse in the elderly who are 65+ or older, it doesn’t mean there are no differences. Many health professionals consider that elderly patients are more likely to eliminate Vyvanse at a substantially slower rate than younger adults. The extended elimination half-life of Vyvanse in elderly patients may be caused by reduced hepatic blood flow, health problems, polymedication, and/or decreased overall physiologic functionality. However, some researchers think that lower renal function is not main reasone for decreased clearance of dextroamphetamine in elderly population; however, a more specific cause was not found. It could be due to a range of complex physiologic changes that occur with old age. How body weight and height (body mass) may influence Vyvanse elimination? Your height or weight correlated with Vyvanse dose you take may influence elimination of this drug. Usually the greater Vyvanse dose is taken and the lower is the body mass, the longer will stay in your system. The lower the dosage of Vyvanse is taken, and the greater is body mass, the shorter it will stay in your body after administration. Thus, if you are a larger individual with bigger BMI and are only taking the minimal dose of Vyvanse which is 30 mg, you will likely clear the drug faster from your system than lower-weight patients using the same dose. This is because there is less of an exogenous chemical within your body relative to the size of it. How percentage of body fats may influence Vyvanse elimination? Although Vyvanse is not stored in body fat, it could also be hypothesized that body % of body fat may have an impact on clearance time. How food intake may influence Vyvanse elimination? Although Vyvanse can be taken on an empty stomach or with food, it is suggested that some types of food may decreases its absorption. As a result of the indirect effect of food on absorption timing and efficiency, it could be supposed to also affect the elimination time of Vyvanse from a person’s system. Even though the effect on elimination time wouldn’t be specifically major, it still should be mentioned. How metabolic rate may influence Vyvanse elimination? Vyvanse is known to prompt up a person’s metabolic rate, which is why many patients using Vyvanse will experience weight loss. It is important to know that a person’s pre-medication basal metabolic rate (BMR) can have indirect effects on drug clearance. In general, those with higher pre-treatment metabolic rates are supposed to eliminate the drug faster than those with lower pre-treatment BMRs. Baseline BMR is unlikely to make a huge difference in clearance speed, but even a tiny difference should be considered. How hydration may influence Vyvanse elimination? Large % of Vyvanse is excreted via urine, therefore staying hydrated could either enhance excretion if you were dehydrated. This is because of the fact that your urinary flow rate can impact the speed at which drugs are cleared from your body. When you are well hydrated, your urinary flow rate is faster and Vyvanse is excreted quicker. How urinary pH may influence Vyvanse elimination? Urinary pH is able to decrease or prolong drug clearance. Specifically, the more acidic your urine is the faster you will excrete Vyvanse and vice versa. The half-life of Vyvanse in acidic urine can fall down to 8 hours, whereas elimination half-life in alkaline urine can increase between 16 and 31 hours. How gastrointestinal pH may influence Vyvanse elimination? The gastrointestinal pH may affect the bioavailability of Vyvanse as well as its absorption. When your gastrointestinal tract is highly alkaline, an increased amount of dextroamphetamine will be absorbed through lipid-rich cell membranes. Opposite if it is highly acidic; the drug stays in its hydrophilic format, resulting with decreased absorption. How kidney function may influence Vyvanse elimination? Vyvanse is predominantly excreted via kidneys. Individuals with ESRD – end stage renal disease patients tend to eliminate the drug much slower, compared to those with normal renal function. As a result, taken dose of Vyvanse could result in dextroamphetamine accumulation, thus extending its half-life and possibly provoking toxic effects. It is often recommended that patients with renal issues need to reduce the dosage of Vyvanse, in order to reduce the burden on their kidneys. The increase in elimination half-life as a result of functional kidney problems is largely subject to individual variation based on severity of the kidney damage. The maximum daily dose for such patients should be only 50 mg.
How the dosage may influence Vyvanse elimination? The higher is the dosage of Vyvanse that you are taking, the greater is the load on kidney functioning. At higher doses, such as 70 mg per day, too much of the drug will be ingested, and this is also the burden for aborption, and metabolism. This means that there will be a greater amount of metabolite “dextroamphetamine” circulating throughout your system. As a result of the dextroamphetamine greater levels in blood, it is more difficult to kidneys because to efficiently excrete a higher amount of the drug at a time. Additionally, if there is increased amount of dextroamphetamine in the blood there is a higher chance it will get reabsorbed before excretion that may result in a prolonged elimination half-life. Patients taking lower doses (related to their body size) should metabolize and excrete the drug faster and efficiently. There is less amount of the drug to metabolize producing fewer metabolites and there’s less amount of the drug to accumulate within the kidneys before to excretion. If you are taking a lower dose, it’s significantly easier for your body to efficiently eliminate the drug. How the frequency of use may influence Vyvanse elimination? When calculating how long Vyvanse stays in your body after discontinuation of therapy, it is necessary to consider how often it is used as well as the total time length over which is used. The more frequent Vyvanse is used it is more likely to remain longer time in your system after discontinuation. Although most patients take Vyvanse just once per day, some of them may be prescribed to take it twice. However patients may take Vyvanse on an “as needed” basis in order to avoid significant tolerance. Those who are using Vyvanse twice a day are considered as a “high frequency” users, while others who are using this drug on “as needed” (less than once per day), are considered as a “low frequency” users. High frequency users will be more likely to accumulate the drug within the kidneys before excretion. Also, it is necessary to understand that when drug is administered frequently, the possibility of tolerance to increases. This may result, that frequent users usually become tolerant to high doses, accumulating more of the drug and its metabolites within their system. Elimination half-life times also increases among frequent users. Low frequency users are less likely to accumulate Vyvanse in theirbody because they are not taking drug often. Patients who take Vyvanse just once or twice a week probably won’t get important tolerance to the drug’s effects and will be more likely to develop benefit from lower doses. As a result of taking lower doses and no important accumulation of the drug related with frequent dosing, infrequent users are more likely to have a shorter elimination half-life and a faster clearance time. How the coadministration of other drugs may influence Vyvanse elimination? Although Vyvanse is predominantly metabolized by enzymes in erythrocytes, its metabolite dextroamphetamine undergoes additional metabolism by a range of enzymes. As a result of certain enzymes contributing to the metabolism of dextroamphetamine, complete systemic clearance may be expedited or prolonged as a result of simultaneous ingestion of other drugs. Drug will alter clearance times if affects enzymes such as: dopamine beta-hydroxylase, CYP2D6, butyrate-CoA ligase, flavin-containing monooxygenase 3, and/or glycine N-acyltransferase. Drugs known as “inducers” of the mentioned enzymes should accelerate the metabolism and reduce elimination half-life of dextroamphetamine. However, drugs considered “inhibitors” may extend clearance of dextroamphetamine from the system. Be conscious of other substances that you’re taking along with Vyvanse and know that they may affect timing of systemic clearance. Will Vyvanse make you fail a drug test? Yes, Vyvanse will give positive test on amphetamines since lisdexamfetamine is amphetamine derivative. Amphetamines are classified into class II of controlled substance and considered with a “high potential for abuse”. S489 : What is it and what does it do?